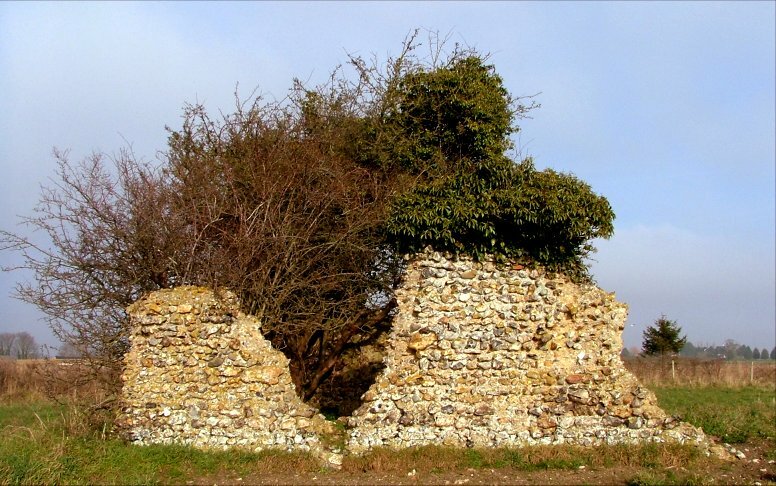 Two broken flint walls boil with elder in a field on the road between Colton and Barnham Broom. At first instinct you know they must have been a church, because why else would they have been left here? 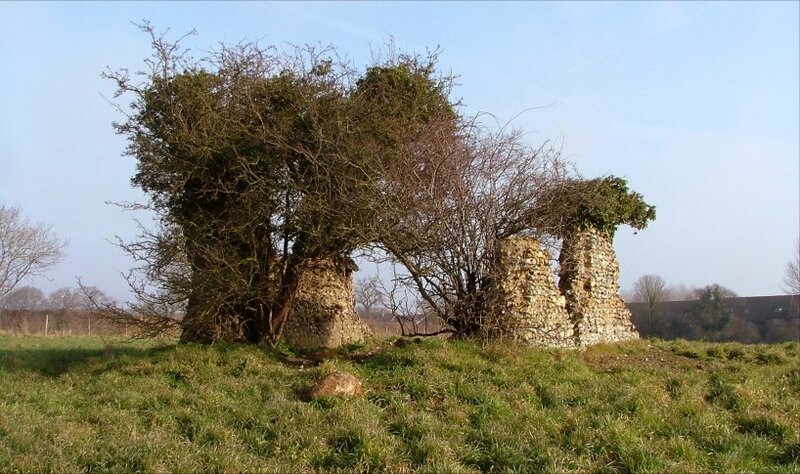 And your instinct tells you that, as so often, they must have been the base of the tower, but when you stop, and go into the field, you have to question this, because they are simply too thin, and in any case the shape they make is a rectangle, not a square. 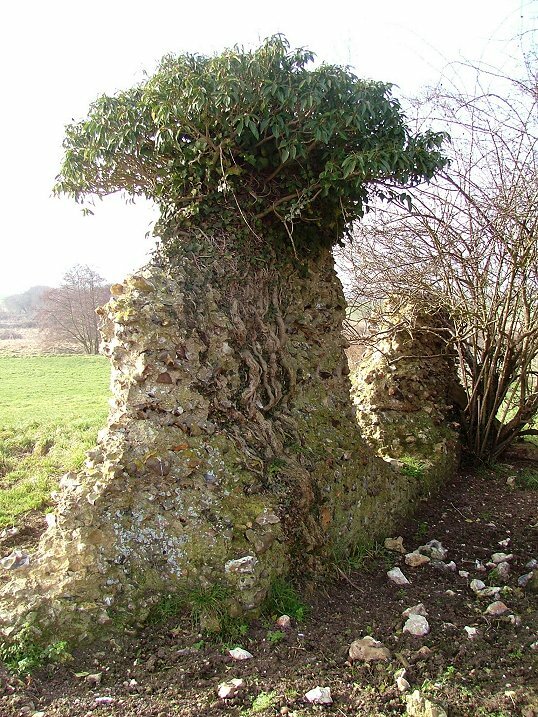 In fact, they are probably the remains of a Norman church, perhaps like Langford before the chancel was added, and the break in the middle shows where the windows were. There probably never was a tower. We parked in a field entrance on the other side of the road, and went through the gate to explore the ruin. After a night of rain, the ground was boggy, and the huge electricity pylons that stride across the field were humming and crackling in an unnerving manner. Half a dozen adult swans sat just beyond the ruin, watching us sulkily. A country boy at heart, I'd rather face a cow than a swan, but they didn't move to threaten us or anything. Perhaps they were stupified by the electricity. 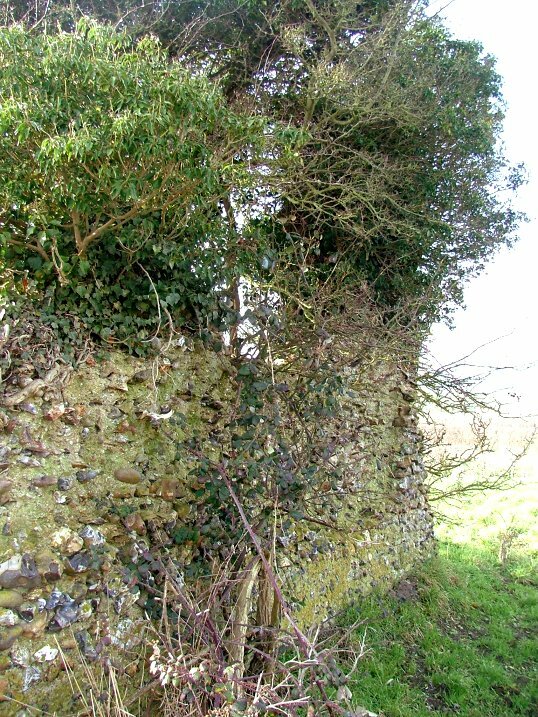 Bickerston, sometimes recorded as Bixton, is in the parish of Barnham Broom, and has been for centuries. There are no parish records in existence, suggesting that St Andrew fell into disuse at, or even before, the Reformation. Pevsner records the dedication as All Saints, but anciently it seems to have been to St Andrew. Not that it makes much difference now, of course. 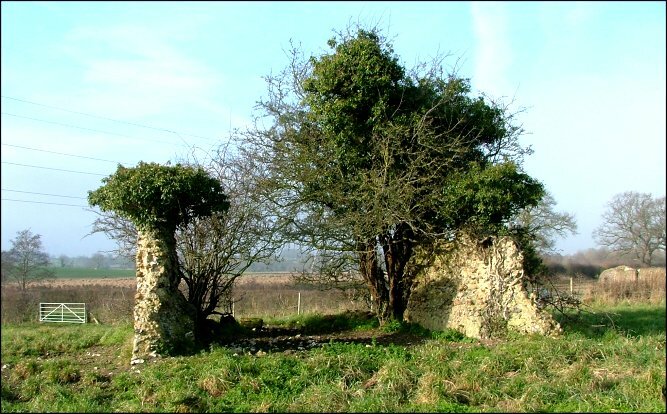 The elder trees are ancient, their thick roots working deep into the clunch, holding the ruin together as much as destroying it. You couldn't possibly remove them now. I stood in the middle of it all, imagining what might once have happened here. The swans watched, saying nothing. On the far side of the field, the golfers on the links of Barnham Broom country club moved surreally in the winter quiet.